”and so he will probably be too tired to vote. His coaching program with me is once every two weeks. One part MWA value-alignment workshop (designed for his team’s values), one part responsiveness coaching (RC) with whatever he feels he needs to work on (we use these 9 areas as his categories) alternating between the two each time we have a session. He writes the agenda for the RC session, and that’s what we were meeting for this time. My heart sank, but I bit my tongue and let the quiet sit between us for a moment, and sure enough, he launched into what had really been on his mind. I’ll call him Ace as I explain. Ace is one of those who are the ‘fortunate’ to still have their jobs. Click here for larger image and commentary. They were already running a tight ship, and so Ace went from playing a strategic hand of poker to thumbing through more than twice as many cards in what seems to be an endless game of war. Ace’s hours have increased dramatically, and most of our coaching sessions in previous months to improve his productivity now seem like they never happened; he is bringing work home again. Essentially, Ace has gone from handling a manager’s job to filling in for the staff he lost, and doing any “management stuff” on his own time. There have been some allowances and shifts made in his company’s business plan, but they still fall far short of what is humanly reasonable on the labor front. So Ace and I sat for another hour, throwing out that action plan we’d initially done and collaborating on a new one that would be more realistic for him. As far as I’m concerned, no one should be too tired to have an opinion, and too tired to care. Life is just too short for complacency or apathy and feelings of helplessness. If you are in a situation like Ace, do NOT accept it. If you have to work extra hard anyway, work to change it. I know it is more easily said than done, but damn it, you have to create your own destiny. What Ace and I did was explore the depth of his circle of influence with the company business plan. As a manager, Ace needs to get back to playing offense, not defense, and get control of his hand back from the dealer. If you have to think ‘bigger than the job’ or ‘outside the box’ as one of the remaining ‘fortunate few,’ push the edges of that box upwards too, not just down. Voice your insider’s viewpoint. Work ON your company and not just trapped withIN it. Flickr image: Aces by Auntie P.
Left, right or center: Can we all agree how REMARKABLE this election truly is? Coaching on Self-Leadership: Is your growth plan set? We have wrapped up the month of August on Managing with Aloha Coaching: Here is a quick recap of our study on Alaka‘i, the Hawaiian value of leadership. Leadership is a huge topic, and our focus was on where it all begins: Self-leadership. If we cannot effectively lead with the brilliant example of our own behavior, why should anyone think about following us? Opportunity for caring and courageous leadership is spreading like wildfire. I find that I am thinking about leadership an awful lot because to be perfectly blunt, I miss it terribly. Remarkable leadership would make me wildly jubilant (buzzwords are fascinating, aren’t they?) however I must say I’d do cartwheels and sing out loud for more basically sound leadership too. I crave new heroes for our modern, right-now world, heroes who inspire the rest of us to be better than we now are. I crave for heroes everywhere, and I want lots of them. Click to the full article: Alaka’i, Chiefs and Indians. I see self-leadership as a necessary prerequisite to those "small groups of productive people [who] function together." In today’s essay, I’ll take a stab at defining self-leadership from the Alaka’i viewpoint. But first, I think it will be helpful to consider two value-drivers I think are very closely related to the leadership of Alaka’i: Kākou and Lōkahi, both of which we have studied here before. Click to the full article: Why Self-Leadership? "Rosa, I know you can write a whole book about it if you set your mind to it, but can you give me a definition for self-leadership in just one sentence?" After giving it some thought, here it is. We have called self-leadership a growing process of arriving at one’s own choice. What is this process, and why is this kind of growth so important to you? It may be helpful to answer the second question first, for if it isn’t important to you, why bother? In thinking this through, let’s use something that is practical and of immediate use to you, something which is usually a staple on the manager’s To Do List: HIRING. Rosa: One of my favorite posts that you’ve ever written is the 12 RULES FOR SELF-LEADERSHIP. I keep it on my cell phone and pull it out to read on occasion. It is some timeless advice. I hope that you will include a link to that for your readers this month. Tim, your wish is my command! However I would like to do a bit better than that for you: Let’s reformat those 12 Rules within our recent August study here. I have three reasons for doing so. Our overall goal at MWAC during August was to create a personal growth plan for our own statement of self-leadership (and thus our learning within that plan going forward). If that is something you feel you need it is never too late to begin. Get into rhythm with Managing with Aloha Coaching and use the archives there to your full benefit within your self-paced coaching. If you use this as a self-contained lesson plan (how I design all my monthly coaching modules on MWAC), read and work with each article sequentially: They are in order, and build upon each other. If you need my help, let me know! It has to do with this seemingly off-the-wall quirk in my list of favorite places to be. I, Rosa Say, have a thing for military bases. When I lived on one I was a teenager, and my dad had been temporarily stationed at Subic Bay in the Philippines; we went with him. 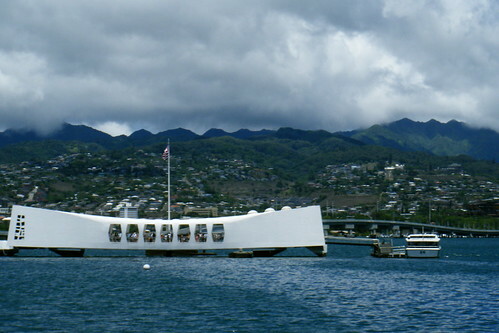 However I have equal measure of memories from the rest of my time living right here in Hawai‘i, for the U.S. military presence is exceptionally strong and varied here, a presence which includes just about every branch of the Armed Forces. To not be invited to a military installation every so often is akin to living the hermit’s life under a rock, and these days you would be very hard-pressed to find an island resident not related in some degree of separation to someone who has served in Afghanistan or Iraq. Why are military bases among my very favorite places to be? It has to do with their prevailing sense of control, order and discipline, a bit ironic when you consider that the common thread of what our Armed Forces fight for is democracy and all the freedoms of independence and self-expression. Sometimes, rules are good for us. 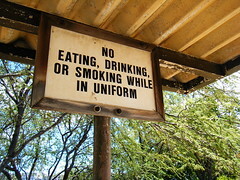 That is to say, enforced-rules are good for us. Say "military base" to me, and these are my word-associations: Control, order, discipline, cleanliness (both people and place), civilized behavior, precision, nobility, honor, decorum, history, respect, legacy, time-tested mettle, bravery and valor, quiet and peacefulness. I was so impressed with how clean and well-kept this entire area was; if only all of O‘ahu could look this way in her public spaces! Realistically there may be some negatives which exist, but they honestly do not exist for me. 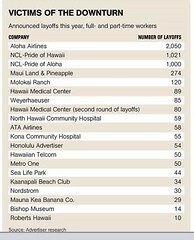 This may be blasphemous to some in Hawai‘i, but I will forthrightly say I love having the military in our islands and I hope they never leave. I admire their code of behavior and their values, and I like the physical results of those values where they reside in our islands. On this particular day, my military places experience started with the Ford Island Theatre. 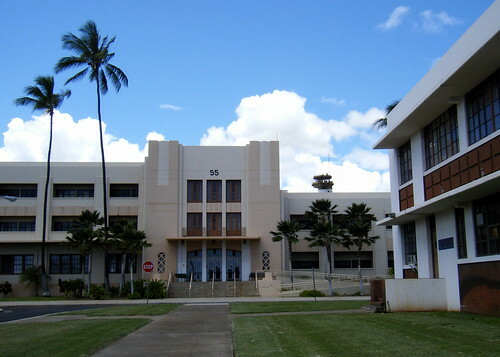 » Ford Island: Building No. 65, now gone, was a 1932 arched wooden construction that doubled as a gymnasium. Building No. 89, at the ferry landing, a concrete-and-pile structure so substantial that it doubled as a bomb shelter, was completed later in the war. Movies played at the 400-seat theater until 1980. Even during the great period of military-theater construction during World War II, the Ford Island Theater stands out as a unique structure," said Dodge. "The Modernism style stripped down the building to a clean, simple box with minimum exterior detailing. The smooth plastered walls are almost reflective against a blue sky. All the visual focus was placed on the grand entrance stair and expansive open lanai. The Ford Island Theater’s modern design was really a prewar vision, which was immediately stifled with camouflage paint and nightly blackouts. The theater would not be painted a lighter color, as originally intended, until after the war. Recently, $14 million was spent on "adaptive reuse" of Ford Island Theater – which is on the National Register – converting it into a conference center. 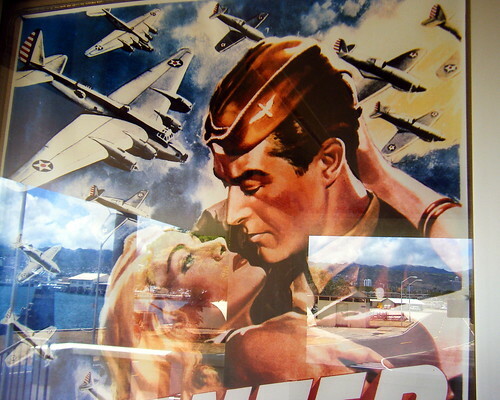 The theater lobby and box office were retained, and even feature ’40s-era movie posters. I yearned for the old theatre that I had not ever seen (if anyone can find a picture online, please share it with me!) however I was also intrigued with seeing the new. Ford Island has always been a place of mystery to me. When I was growing up "just up the road" from Pearl Harbor you could only reach Ford Island by military ferry; if I’d ever been there I didn’t remember it, and as I grew older just assumed it wasn’t a realistic option. 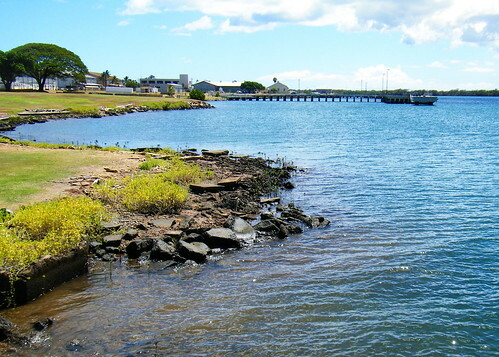 The present Admiral Clarey causeway was not constructed until several years after I had moved to the Big Island, and far as I knew, there was still no access without military ID in hand. I frequently fly over Ford Island on my inter-island business trips, and each look out the airplane windows reminded me it was a place I had not been to, curiosities about it left restless and unsatisfied. not on the usual tours of the Pearl harbor Historic District. My photos have descriptions which are a combination of my personal journaling that afternoon and information I subsequently looked up online. It was an afternoon I want to remember; the military presence in Hawai‘i has impressed me once again. There is so very much we can learn from each other. So much. "Two months after the war, while docked at her Hudson River berth in New York City, the USS Missouri was boarded by 60,000 sightseeing school children in a single day. The children did so much damage to the ship that she had to go to the Navy Yard for repairs." Interesting interview with movie co-producer Jerry Bruckheimer by National Geographic: Beyond the Movie. There was one memorial that moved me the most; it was where I ended my visit that afternoon, and when I left I was determined to find out all I could online. "USS Utah has been almost forgotten. 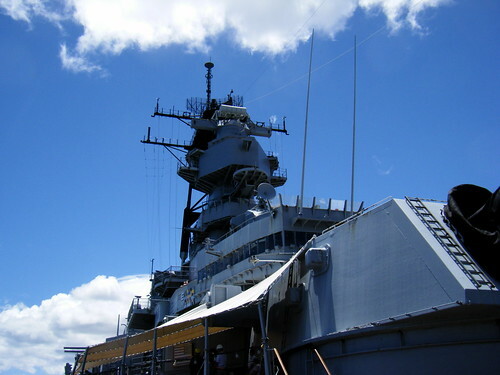 Seldom honored by public visits, it rests in the waters of Pearl Harbor as a distant memory of America’s most remembered day, a sad epitaph for a fine battleship. A Florida-class dreadnought battleship, first launched in December of 1909, she was the only ship of the United States Navy to be named for the U.S. state of Utah." 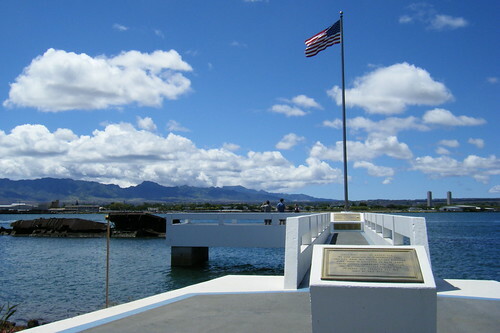 "Near this spot, at Berth Fox 11, on the morning of 7 December 1941, the USS Utah was struck on the portside with what is believed to have been three aerial torpedoes and was sunk. She was subsequently rolled over to clear the channel, but was left on the bottom." Then as you move to the next marker at the base of the flagpole, the names of 58 men who are entombed with her. It truly hurt to see this ship left this way in rusted remnants, especially after visiting the dignified nobility of the oft-visited USS Missouri and USS Arizona memorials. 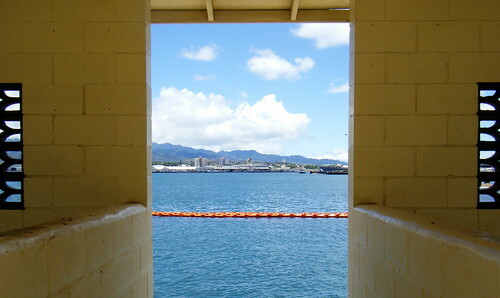 A bit of glee to share with you in what was such a memorable day for me: If you have the same opportunity to visit Ford Island, or any of the sights of the Pearl Harbor Historic District, do. It is a visit that will stay with you. I will be back, for I want to see more, feeling more of what those places will surely make me feel, learning more of what they can teach me. However I am also hoping you will take some time to visit my set-within-a-set of the story of the USS Utah, which starts here, and continues for 10 photos. 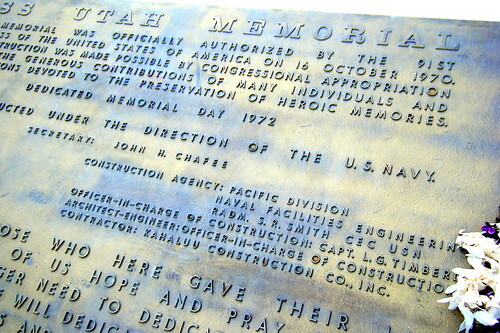 Even though it will be a virtual visit, I am pretty certain you will remember it too, and we can do our small part as the Ho‘ohana Community so that the USS Utah will not be forgotten. I have long felt that the answer is connected to learning; stop learning and you stop growing. Our bodies may slow down their growth rate as far as outside appearances go, but that doesn’t mean we slow down on the inside, particularly in regard to how our brains work. Learning is connected to thinking; and unlike our physical aging, that is a kind of growth that we cannot readily see, unless what we look for are the effects of it. What has changed, and has it gotten better? This has turned out to be a very strong sub-theme for us in our study of Alaka‘i, the Hawaiian value of leadership, our value for the month of August over on Managing with Aloha Coaching. To look upon my more recent posts here you might think I have been too absorbed with photography and Flickr, but truth is that I have been absorbed with the discussions of self-leadership that have resulted with my managers as triggered by Alaka‘i. What is this growing process of arriving at one’s own choice, and why is it so important to you? Tuesday Essay #1 on Alaka‘i: Why Self-Leadership?